Gray Wolf In Cross Hairs Again After Delisting Congress removed the gray wolf from federal protection last month. Many locals and some conservationists in the Mountain West agree the delisting may not be the worst thing. Conservation groups howled when Congress removed the Rocky Mountain gray wolf from the federal endangered species list. The "delisting" in most of the Northwest was attached to the budget deal in April between the White House and Congress. The head of one environmental organization likened it to Congress throwing the wolf off Noah's Ark. But now that states like Idaho have full authority over the wolf's fate, they're eager to use it. Idaho Fish and Game Regional Supervisor Dave Cadwallader welcomes the delisting because it allows the state to treat the wolf like any other animal. "Wolves are classified as a big-game animal in Idaho, and we fully intend to manage them like we do our other big-game animals that we've done successfully, bears and lions, for example," he says. "And we want to be able to do the same with wolves." That most likely means annual wolf hunts. The state hasn't yet settled the details of its wolf management plan, but it's already started shooting them. Idaho Fish and Game recently sent helicopters to a part of the state where wolves are thought to be killing too many elk; the "aerial gunning," as it's called, killed five wolves. Residents of Elk City, a tiny town in Idaho's Clearwater Mountains, say they've been especially plagued by wolves. They say the wolves are killing huge numbers of elk and driving the frightened survivors right into town. And other animals have been killed. Stan Denham lost one of the hunting dogs he keeps on his land just outside town. The gray wolf was once a dominant fixture on the American landscape. Although the animals were all but eliminated by the early 20th century, packs have started to reassert themselves in the Northern Rockies. Today, wolf packs roam across thousands of acres. Prior to colonial expansion, the gray wolf roamed most of the American West including prairies, forests, mountains and wetlands. By the 1930s, the animal had mostly disappeared from the Northern Rockies because of hunting and loss of prey and habitat. In the 1980s, a number of wolf packs started to travel down from Canada and began repopulating different parts of the region. Today there are over 240 packs across the region. The wolf was delisted from the federal endangered species list (except in Wyoming) in May 2011. Gray wolf ranges shown are approximate. "They attacked her right over here and then dragged her down over to the timber," Denham says. "The whole hillside here seemed like it was covered with blood." Denham also happens to be one of the sheriff's deputies in Elk City. 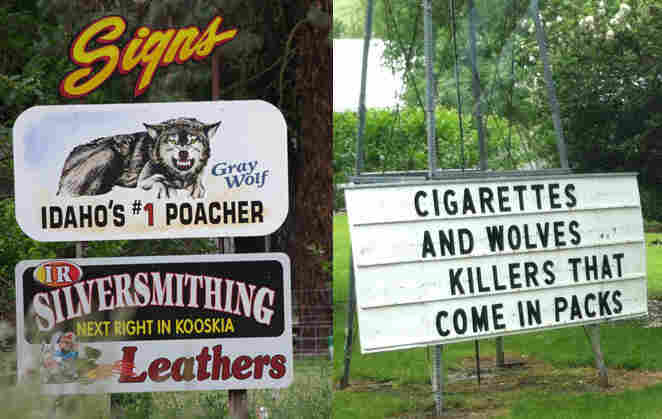 In May, the state gave the deputies special authorization to shoot wolves in town. "This is actually a request to hunt them and put some effort into shooting them, whether they're causing problems or not," he says. The science isn't clear on whether killing wolves will bring back the elk. But when it comes to wolves, science is sometimes beside the point. John Freemuth, a political science professor at Boise State University, tracked the politics of this issue. He says anti-wolf feelings have deep historical roots. "The wolf was viewed as a sort of a bad species, a predator that needed to be removed so the West could be settled and developed," Freemuth says. People worked hard to eradicate the wolf. And then, a few generations later, the federal government said those methods were wrong. In the 1990s, it brought in fresh wolves from Canada. "Suddenly it's being brought back and it's a good species to have on the land," he says. "The history there just suggests that some people are going to be a little befuddled by that." Befuddled — or just plain angry. And in the West, it's not unusual for the wolf to become a symbol for other contentious issues. Sitting in the general store in Elk City, Carmen Williams considers the feds' insistence on bringing back the wolves and sees a deeper motivation. "Gun control in disguise," he says. "If we don't have any game left to shoot, what's the sense to carrying a rifle?" 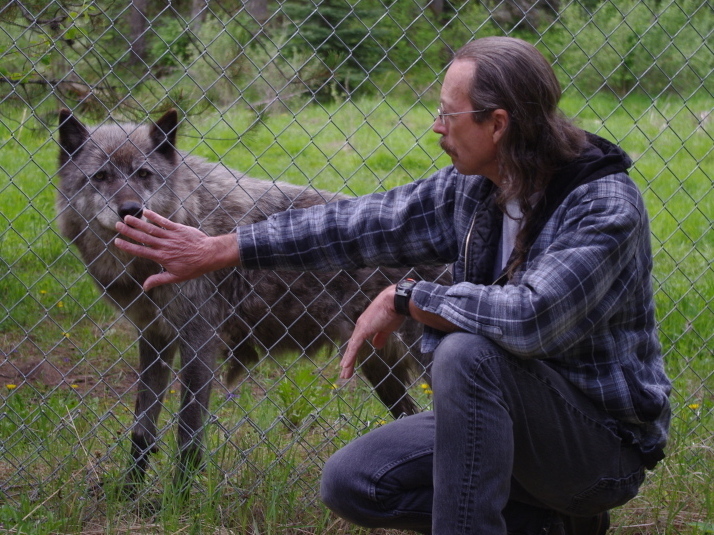 Randy Stewart greets a gray wolf through the chain-link fence at the Wolf Education and Research Center in Winchester, Idaho. Stewart says attitudes toward the species have sharpened in recent years. These aren't majority opinions in Idaho, but they represent powerful political undercurrents, which have been intensified over the past few years by the prolonged court battles over when and how to take the growing wolf population off the endangered species list. Randy Stewart has seen some of that anger over the years at the Wolf Education and Research Center, in the small town of Winchester, Idaho. Behind a chain-link fence, a gray wolf silently touches its nose to Stewart's hand in greeting. Stewart, who guides tours at this wolf center, says he has seen attitudes sharpen in recent years, on both sides. "There are probably still people that don't want wolves here, that want to see them all removed, and there's still people who say don't hunt a wolf," Stewart says. "But we're not in a society in my opinion that we can have one or the other extreme." Some Western conservationists are hoping the delisting of the wolf also has a silver lining. They say now that the wolf is no longer federally protected, maybe it can also shed its reputation as the federal government's pet.